In the past, MRD testing was infrequently performed for most BCLs because the diseases were thought to be incurable in all but the very early stages. However, recent use of new therapeutic modalities such as monoclonal antibodies and vaccine therapies for treatment of BCL has resulted in improved clinical outcomes. Multiple large prospective studies have clearly demonstrated the high prognostic value of MRD monitoring in children with acute lymphoblastic leukemia,34,35 and molecular remissions associated with prolongation of progression-free survival and possibly overall survival have been seen in some clinical trials of new therapies for BCL patients. 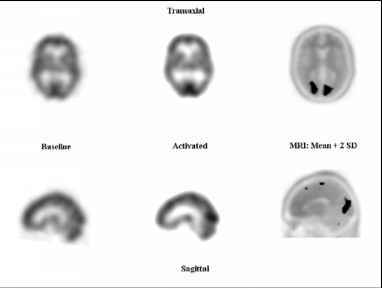 With improvement of therapies, new methods for MRD detection are desperately needed as BCL patients achieve complete clinical, morphologic, and immunophenotypic responses. Unfortunately, the optimal methodology and timing for detection of MRD has yet to be determined for any subtype of BCL, and inexpensive and easily standardized methods for MRD detection of BCL have not been identified. MRD detection in BCL is at once simpler than initial diagnostic or prognostic testing and more complex. The number of targets for which testing must be performed is limited in comparison to initial diagnostic testing, but the need for markedly increased sensitivity makes the testing more demanding for the laboratory and significantly increases the possibility of false-positive and false-negative results. Ideally, techniques used for MRD detection should have a sensitivity level to detect one BCL cell in 105 to 106 normal cells, be applicable to almost all patients with the disease, provide some quantification of the target, and be rapid, inexpensive, readily standardized, and disease specific. MRD assays also should have good intralaboratory and interlaboratory reproducibility. In reality, most commonly used molecular analyses for MRD detection in BCL, which target IGH rearrangements, do not meet many of these criteria. Assays closest to the ideal are quantitative or nested PCR detection of patient-specific, junctional region IGH gene rearrangements or IGH/BCL2 chromosomal translocations. For most subtypes of BCL, either no translocation-associated molecular event is available for MRD testing or the recurrent translocations occur in too low a proportion of the BCL subtypes to be clinically useful. IGH gene rearrangements are typically targeted for MRD detection in these diseases. The only sufficiently sensitive and specific method of testing for MRD detection using IGH gene rearrangements is patient or clone specific. This method takes advantage of the fingerprintlike sequences of the junctional regions of the rearranged IGH gene, which differ in length and composition for each B-cell clone. Multiple IGH PCR analyses of BCL biopsies at diagnosis or relapse are performed, the PCR products are cloned, and the junctional regions of the clonal IGH rearrangement are sequenced. The clone-specific IGH rearrangement sequence is then used for design of patient-specific PCR primers, which are subsequently used in standard or real-time PCR assays to assess MRD for that specific patient. The usual target for MRD detection is the VH-JH rearrangement, but the use of two MRD targets also has been recommended for reliable and sensitive MRD detection, if possible. Patient-specific IGH primers increase IGH PCR sensitivity up to 1000-fold (1 positive cell in 105 normal cells) compared to consensus primers for IGH gene rearrangements (1 positive cell in 102 to 103 normal cells). In patient-specific IGH PCR, the background signal from polyclonal B cells does not obscure the clonal PCR products. If clonal junctional region sequences are not identified for generation of patient-specific primers, differences in the length of rearranged IGH junctional regions can be evaluated only by PCR product length assessment. The sensitivity of this technique, even in fresh material, is not sufficient for MRD detection. The consensus IGH primers used in standard IGH PCR assays result in less-efficient amplification than occurs with better-matched primers. Thus, standard IGH PCR tests can detect only one malignant cell in 102 to 103 normal cells. Real-time quantitative PCR (RQ-PCR) techniques using standard IGH primers do not increase the sensitivity of detection of IGH rearrangements to the optimal level for MRD detection but may provide some information about disease course over time. The combination of patient-specific IGH primers and RQ-PCR could make a major contribution to the achievement of standardized MRD detection in BCL. detection of MRD in patients with precursor B leukemia/ lymphoma and would likely be useful in BCL patients also. This type of MRD testing is currently performed mainly in specific research laboratories for patients in lymphoma clinical treatment trials. As therapeutic options increase for BCL patients, quantitative and sensitive MRD testing will become more routine. Figure 32-3. Illustration of PCR analysis for detection of MRD in sequential marrows from three patients with FL. Each marrow is subjected to PCR for P-globin housekeeping gene and IGH/BCL2 M-bcr analysis; PCR products undergo gel electrophoresis and positive bands are detected by ethidium bromide staining (P-globin PCR results shown in top position, IGH/BCL2 results in center position in each panel). 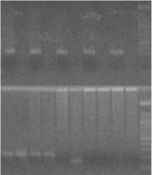 A positive band is seen only if an appropriate product is detected; specificity of bands is confirmed by the use of multiple controls and also by probing of the Southern blotted IGH/BCL2 PCR products with a BCL2 probe (shown in bottom position in each panel). (a) Controls run in parallel with patient samples are critical for interpretation of this assay (see box insert). Positive controls are serial dilutions of an IGH/BCL2-positive cell line (lanes 4-7). The 106 dilution is run twice; as shown, a positive result is often detected in only one of these samples at the lower limit of analytical test sensitivity. 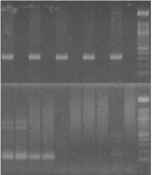 (b, c) Parallel PCR analyses of five sequential marrows from two different FL patients. For each patient, sample A is pretreatment, B is 1-2 months after CHOP chemotherapy but before treatment with anti-CD20 monoclonal at only one positive cell in 104 normal cells. Rare laboratories report an RQ-PCR analytical sensitivity of one positive cell in 105 normal cells. The clinical relevance of the difference in sensitivity between nested PCR and RQ-PCR is not clear, and it is possible that the measurement of serial quantitative levels of cells carrying the IGH/BCL2 translocation, that is, the trend over time, may be more clinically important than having a higher level of sensitivity. An underrecognized problem in interpretation of RQ-PCR analyses for MRD in FL is the inability of these assays to compare the PCR product size to that of the previous diagnostic or MRD FL sample. With a highly sensitive test capable of detecting MRD in FL, a rare benign IGH/BCL2 transloca-tion-carrying cell could produce a false-positive result if a comparison to the original clone is not made (Figure 32-3). This comparison is readily performed with nested PCR but requires substantial additional molecular analysis with RQ-PCR. However, using an RQ-PCR method for MRD detection and providing information about the trend over time for a given FL patient may obviate the necessity for this additional antibody (Ab), and marrows C, D, and E were obtained 2 months, 6 months, and 12 months after anti-CD20 monoclonal Ab therapy. All clinical samples from each patient were run in duplicate. The patient in (b) is positive for IGH/BCL2 at diagnosis and after CHOP, but the marrow becomes PCR negative by 2 months after Ab therapy and remains negative at 6 and 12 months.The patient in (c) is also PCR positive at diagnosis and after CHOP, but has a positive band in one lane at 2 months after CD20 antibody therapy. This band is confirmed to represent a benign IGH/BCL2 positive cell, not MRD, as it is not present in the duplicate sample and is clearly a different size from the patient's previously identified FL clone. This patient has achieved a molecular remission, but would be called positive by assays that do not evaluate the size of the product in comparison to the original FL. In contrast, the patient in (d) also has a positive result in only one duplicate at both 2 months and 6 months following Ab therapy, but these results clearly represent MRD; the abnormal bands are the same size as the original FL clone. c testing. Additional studies are needed to evaluate the clinical efficacy of MRD detection in FL patients in general, and to compare the relative clinical value of the different nested and RQ-PCR MRD detection methods. PCR analysis using patient-specific primers is seldom performed in the United States but has been extensively used in Europe for molecular monitoring of MRD in patients with acute leukemias treated on different clinical trials. In addition, the Europe Against Cancer Program has reported a standardized approach for the most common fusion gene transcripts in ALL and BCL, developed with substantial government clinical trial support.